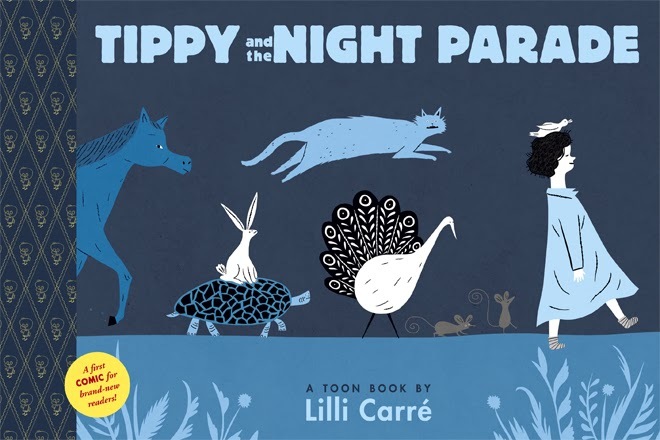 Tippy and the Night Parade is the debut children's book from interdisciplinary artist and illustrator, graphic novelist and animated filmmaker Lilli Carré. Carré's illustrations have appeared in the New Yorker, the New York Times and the Best American Comics and on her very cool tumblr page, Moving Drawings, and now she joins the TOON Books family with this fantastic easy reader. When Tippy wakes up every morning, her room is in a tip! Her mother helps her to clean it up, but remains skeptical of Tippy's inability to explain. As she heads off to sleep, her room clean again, Tippy speculates. Eyes closed, Tippy sleepwalks out of her house and over the bridge into the nearby forest, picking up followers almost every step of the way. Tippy's trail is a twisty one. She hops across lily pads, wanders through the mist and, in my favorite spread, falls down a hole (crab, bee, frog and bear in tow) in a two page spread that requires the reader to tip the book to follow the trail. noted, is clearly the "sort of girl whose waking life is plenty interesting, too." Carré conveys this through her simple but expressive characters. All the animals following Tippy speak with their eyes and movements, yet another reason the reader never worries for Tippy's safety. While you may feel a bit sorry for Tippy's mother at the end of this story, you will find yourself waiting eagerly for more adventures with Tippy and lots more from Lilli Carré!